One of the core components of running a program under the National Head Start Association is to provide participants with quality nutrition services. The Head Start Nutrition program provides guidelines based on all of the rules and regulations required by the USDA child and adult care food program. In addition to providing the children who participate in Head Start programs with nutritious meals, the goal is to create a social and educational experience at mealtimes to integrate discussion of food, health and daily activities as a means of improving communication and conversational skills. Responsibility and teamwork are also educational benefits from mealtimes in Head Start programs, with children helping out with setting the table, feeding themselves, serving others, cleaning up the table and other interactive jobs. All meals are served “family style” to encourage an appreciation of gathering together for meals with a group. The children in Head Start are encouraged to try new foods to expand their palates, but are never forced to eat anything that they don’t want to try. Another teaching opportunity is to refrain from using food as a reward or as a punishment to build healthy attitudes toward food. Administrators constantly struggle with making sure that all of the educational, nutritional, social and health needs of the participants and their families are met. 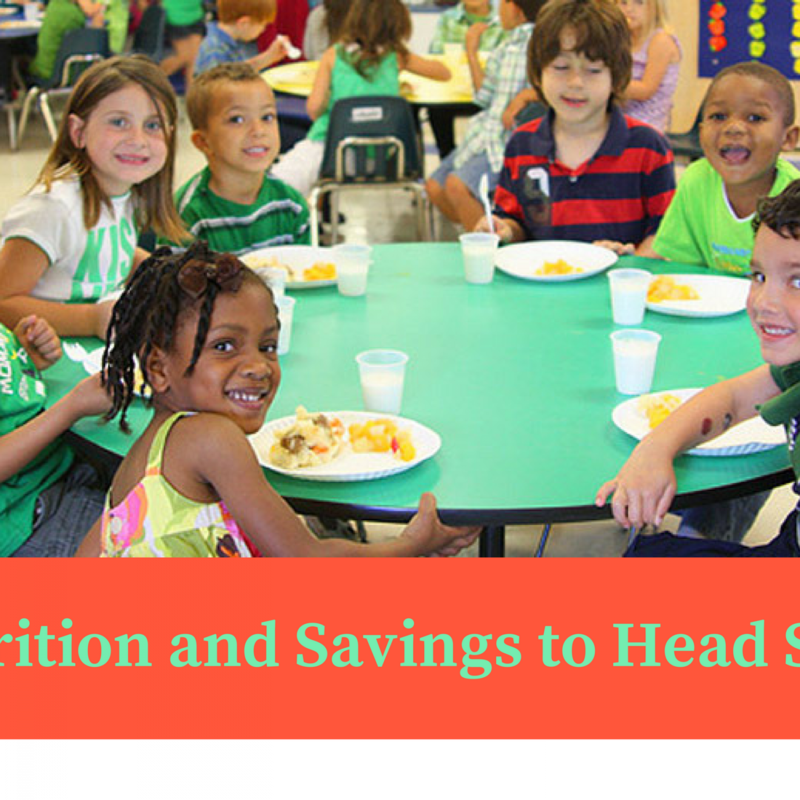 The food that is served in programs that run through the National Head Start Association can be a huge part of the monthly and annual Head Start budget and must be monitored to prevent wasteful spending. The food supply source program at FoodSource Plus provides free menu and nutrition services to Head Start programs to help them maximize their food budget, provide students with nutritional foods, reduce food waste and make smart purchases. The meals that are provided through the Head Start program are designed to meet anywhere between a third and two-thirds of each child’s daily nutritional requirements. The menus that are established by FoodSource Plus for Head Start programs adhere to the USDA/CACFP food program regulations to ensure that children receive proper nutrition. Head Start also works to ensure that the religious and cultural needs of the children in the program are considered when planning menus, which means that pork is not served and peanuts, which can be a highly allergic food, are not served. Children that have any specific allergies or restrictions about certain foods must have a statement from a physician submitted on their behalf by their parent or guardian. A Health Care Plan must be completed with a Family Service Worker by any parent or guardian of a child with any type of food allergy. The physician must complete the Request for Administration of Medication form for any child that is required to receive a food supplement, such as Pediasure, or any other type of modified diet. Food Source Plus can help administrators meet the special needs of these students in order to adhere to the Head Start budget, while providing proper nutritional services. As part of the guidelines set by the National Head Start Association, menu planning meetings will be held once a year and parents or guardians are invited to participate. The notices of these meetings will be posted at the Head Start center site. The free menu and nutrition services offered by the food supply source program at FoodSource Plus to Head Start administrators can be integrated into these planning sessions to ensure that proper nutrition, variety of foods and any allergies or concerns are addressed in the planning process. It is important to note that the Head Start program is intended to be a supplementary meal program and is not designed to replace the meals that the child eats in the home. If parents or guardians need assistance in providing food in the home, they should speak with a Family Service Worker. In addition to meals for young children participating in Head Start programs, the Early Head Start program also supports parental preferences with regard to infant feeding. This includes breast feeding and the introduction of solid foods when appropriate. Each parent or guardian must fill out and sign an infant meal-parent preference letter and provide their own iron-fortified formula and expressed breast milk or decide to allow the center to provide iron-fortified formula. Parents can also come to the center to breast feed. Infant food is prepared and served to program participants on demand and according to the developmental needs of each individual child according to their stage of development. Each classroom will post a toddler menu indicating which food will be served each day. Children ages one and two will receive whole milk. Due to concerns about chocolate allergies in very young children, chocolate milk is not served to infants or toddlers. Children ages three to five will receive 1% milk. The meal services provided through the Head Start budget for children in the Early Head Start program will follow all of the rules and guidelines set by the USDA child and adult care food program. The program available to the Nation Head Start Association through FoodSource Plus is a food supply source and supply purchasing service that provides free consulting for management, budgeting, nutrition and menus for non-profit, human service providers. FoodSource Plus provides top quality food and supplies to organizations like Head Start along with free menu and nutrition services to help administrators stay within the annual Head Start budget, especially during times of budget cuts and sequestration. On average, FoodSource Plus has been able to help our clients through food supply source services to see 10-35 percent in annual budget savings. Participation in the program is FREE to non-profit human service organizations like the National Head Start Association. Give us a call today at 1-866-248-4520 to find out more about our services or to sign up for a FREE menu and spending analysis.